Japanese Episode DP 039: "Pikachu's in Charge!" American Episode 503: "Steamboat Willies!" While on the way to Yosuga City, our heroes come across a wide river. There, they spot a cruise ship, so they decide to go onboard and check it out. As the group's pokemon all play amongst themselves, Satoshi and his friends meet the old man who's in charge of the ship. He tells them the location of a town where they can get some supplies, so the trio leave Pikachu and Potchama in charge of the group while they go shopping. On the ship, the pokemon all enjoy playing in various groups. One group checks out the ship's musical instruments while another group tries on the various dresses on-board. Eventually, Pachirisu inadvertently causes the ship to set sail, sending the ship down the river. As the pokemon continue to play, unaware of the ship's movement, the Rocket-Dan appear and attempt to trick the pokemon into coming with them. After the Rocket-Dan are sent blasting off, Pikachu and Potchama realize that the ship is heading toward a waterfall! Luckily, Satoshi and Hikari, who had heard about the ship's departure from the old man at the dock, arrive just in time to issue the commands that save the pokemon. Now that everyone is safe and sound, our heroes return the ship to its dock. Later, they board the ship again and head down the river toward Yosuga City. I thought this episode was kind of "meh," really. A lot of fans think this episode is one of the best episodes in a long time, but I disagree. While there were some good parts here and there - Gureggru obsession with its reflection, Mukubird's reaction to the pokemon playing music, Takeshi being able to flirt without having to worry about being jabbed in the back - the rest of the episode just didn't do it for me. It was just "cute" event after "cute" event, and while that's OK for the Pikachu shorts that accompany the movies, it doesn't feel right when done in a regular TV episode. I also love how Satoshi just knows how to operate a luxury cruise ship. Reminds me a lot of Kaiba and his helicopter flying skills, really. The dubbed version is great when it keeps the Japanese music (six pieces by my count), but the times it doesn't kind of stick out like a sore thumb to me. I know I go on about the music a lot, but that's honestly because that's the biggest problem I have with the dub right now. I mean, you have Miyazaki Shinji's Japanese music being mixed in with the 4Kids' guy's music mixed with the PUSA guy's music, giving the dub three different composers. And all three of those composers have very different approaches to creating music for the show. That creates a very disjointed feel that just isn't there in the Japanese version (due to that version being 100% scored by one guy), and in episodes like this one, that feeling is very pronounced. But hey...at least PUSA had some (brief) music-less scenes in this episode. That's always nice. Both the opening theme and the ending theme in the Japanese version are updated to include Pinpuku in the various group shots. When the gang first arrives on the cruise ship, the opening theme to the very first Pikachu short, Summer Vacation Fan Club, is played in the background. It continues until the end of the ring toss game. In the dub, this is removed and replaced with some pseudo-rock-ish piece that, in my opinion, doesn't fit the lighthearted action on-screen at all. There's a surprisingly high number of these in this episode. Brock: "Excuse me sir! Would you know if there's a store around here that sells Pokémon food supplies?" Old Man: "Hmm...'course there is. Hmm! You just go through those woods over there and there's a PokéMart that's sure to have everything you need." In the Japanese version, the old man simply says that there's a small town where they can get supplies. The dub kind of omits the whole "town" part, making it sound like there's just a PokéMart sitting out there by itself beside some woods. Giovanni: "That Meowth. What a great guy!" He originally said "Nyasu! I choose you!" Same meaning, of course, but it's an odd change for PUSA to make. Later, the Rocket-Dan show up on the ship and sing their little song. 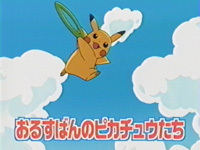 In the Japanese version, the majority of the song is just the trio saying the first part of their motto to the tune of the music, but in the dub, all new lyrics are created for the scene. Lyrics that include the word "jiggy," a term that young people stopped using over five years ago. Dawn: "Buneary and Aipom, you girls look so cute!" Hikari doesn't say anything that indicates gender in the Japanese version. She just says Mimiroru mo Eipamu kawaii! Doushita no? ("Mimirol and Aipom, you're both so cute! Where did you get those...?"). No gender-specific pronouns whatsoever. Aipom's gender is eventually confirmed via dialogue in the Japanese episode, but that's not going to be done for another nine episodes. The TO BE CONTINUED... screen is bla bla three seconds. Bla.